"CHECKOUT OUR SEASONAL COUPONS SAVINGS!!!!! 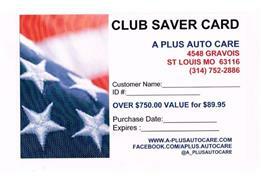 CONTACT US TO PURCHASE OUR NEW CLUB SAVERS CARD. IT HAS OVER $750.00 VALUE FOR $89.95. Welcome to A Plus Auto Care, a full-service preventive maintenance and automotive repair center. We perform high quality, guaranteed service you can trust at a fair price. We repair domestic and foreign vehicles and are your best choice for scheduled maintenance of your car, SUV, truck and fleet vehicles.